Argentine-born, American-based artist and sculptor Cecilia Lueza, studied visual arts at the University of La Plata in Buenos Aires, Argentina. Today, she is well known for creating vibrant public art pieces in a range of mixed media. Throughout her career, the artist has intensely explored a wide range of artistic media, from traditional ones like painting and sculpture- in wood, metal, acrylic and polyurethane- to monumental projects like street murals and public art installations. 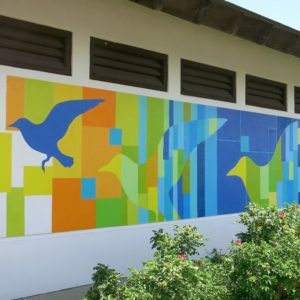 Since 2000 she has been working on a variety of public art projects in many cities throughout the United States. 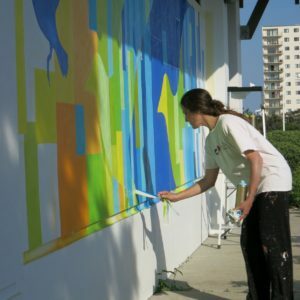 Her work has been exhibited at Art Miami, Arteamericas, and Scope Miami Beach, and in the last year she completed public art pieces in Washington DC, Jacksonville FL, Cedar Rapids IA, and St Petersburg FL among others.